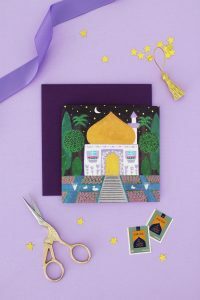 Magic Carpet Cereal Treats – Hello Holy Days! In North America, we know of magic carpets from Disney’s Aladdin. In Muslim folk tales however, such as those compiled in One Thousand and One Nights, flying or “magic” carpets are an allusion to Prophet Solomon’s mat, which could travel by wind as mentioned in the Quran (commentary of Ibn Kathir 21:81 and 34:12). 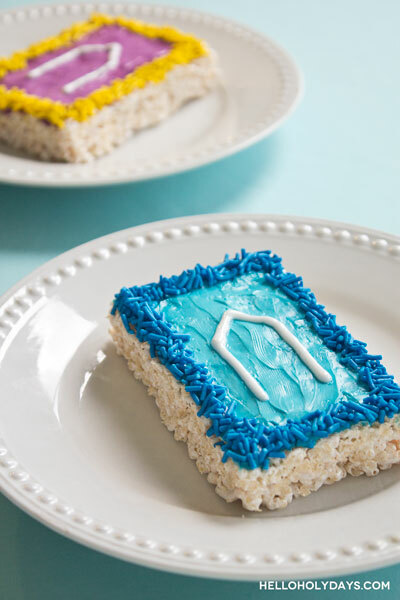 In Ramadan, the month of the Quran, make magic carpet cereal treats for a fun way to celebrate. We’ve made our carpets to resemble prayer rugs, distinguished by the mihrab arch in the center. * Though most recipes call for 6 cups of crisp rice cereal we find that 5 cups works better when using marshmallow fluff instead of marshmallows. Butter a 9 x 13″ baking dish. In a large pot on low heat, melt 3 tbsp butter then, add marshmallow fluff. To aid in removing marshmallow fluff from jar, microwave for 10 – 15 seconds, depending on your microwave. Add cereal to melted butter and marshmallow fluff mixture. Stir well and pour into prepared dish. Working quickly, spread the mixture throughout the dish. Wear a ziploc bag over your hand and pat down to evenly spread mixture. Divide cream cheese into 4 different bowls and add food colouring to each one. Cut cereal mixture in rectangles, approximately 2.5″ wide by 4″ long. Spread a different colour of cream cheese onto each rectangular bar. Add sprinkles to the perimeter of each rectangle and finish by piping an icing arch in the middle. Serve immediately. Makes about 6 magic carpet cereal treats.